In my post on choosing portable antivirus I’ve mentioned problems that background monitor antivirus solutions have if system is already infected. Portable scanners are good tool but even they won’t be able to deal with serious infections. 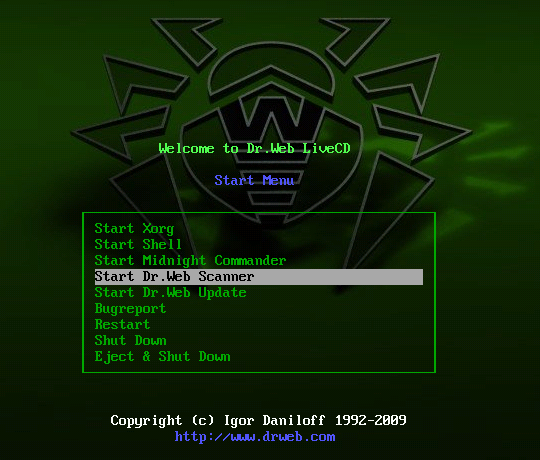 DrWeb LiveCD is all-in-one (and free) bootable antivirus solution. Software comes in form of ISO image that you must burn to CD (as always I suggest CDBurnerXP to do that). Image is under 70Mb in size so will fit even on small 8cm CD discs. or try pressing F8 right after turning computer on usually shows boot menu on most desktop motherboards). …select DrWeb LiveCD option when prompted and it will boot (disc is Linux based) and show you list of options available. Strangely supplied manual shows quite different graphical user interface from what LiveCD actually has. Either it was simplified or not yet finished – I have no idea. Start Dr.Web Update will try to update antivirus (if Internet connection is available and LiveCD could detect it properly). DrWeb LiveCD updates are similar to DrWeb CureIt – you have to re-download entire image to get fresh databases included. Live update obviously can’t write bases to disc and won’t work with plenty of Internet connections. I’d also like to have more control over what to scan and skip – something that is described in manual, but not present in actual software. Manual list instructions to make bootable flash drive from ISO image. It requires booting from LiveCD in command line mode and playing with Linux commands a bit. I hadn’t tested it myself. Free, solid antivirus solution to handle most serious infections. No need for custom Windows LiveCD as with most portable scanner. Not something needed daily but extremely helpful in deep cleaning routine. PS In case you are wondering how I made screenshot from LiveCD – I had used VirtualBox for that. Sounds interesting. Not the kind of thing you use everyday, but for serious stuff giving you booting problems it sounds really nice. It makes sense for virus to have some survival features so plenty of them try to kill any antivirus they see. :) Removing HDD to scan it is good options if you have numerous computers around. But in other cases bootable solutions work best. How can i boot it on a flash drive? I hadn’t tried that myself, see user manual for details. Very good. Be ready for 4 or 6 hours of scanning but it is worth it. Seems bit too long… On other hand hard drives are large nowadays and with LiveCD there is no guarantee it uses hardware to the max. I like Comodo firewall, but don’t have much trust in their antivirus (not their main area). Offline scan with livecd sounds like a good idea for your case. @Rarst I’m about 2+ hours into a scan right now. It’s somewhere in the c:\Windows directory but has been for quite a while. It’s definitely one very slow scan. I sure hope it finds the buggers causing me hassle.